It's not every day that a Facebook post about a kid's $1 weekly allowance goes viral -- and even makes people cry. 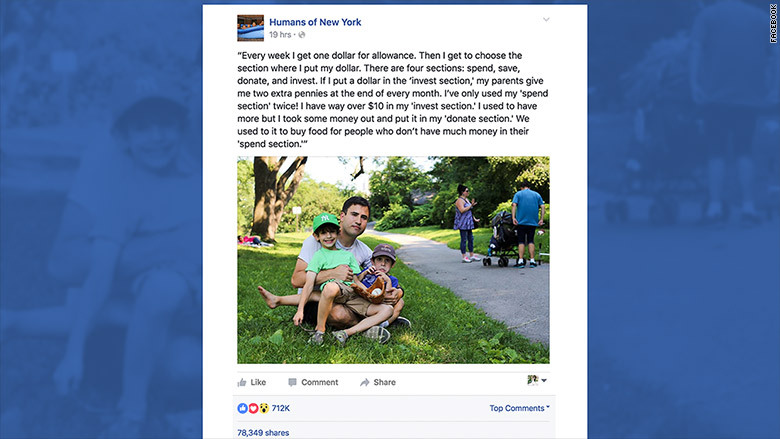 The post appeared on Father's Day on the popular Humans of New York blog and Facebook (FB) feed. It featured a photo of a dad and his two young sons sitting with a baseball glove in a park. The scene is pure Americana. It could happen just about anywhere, but what sets it apart is what one of the sons says about money. "Every week I get one dollar for allowance," the boy explains. "Then I get to choose the section where I put my dollar. There are four sections: spend, save, donate, and invest." If the boy puts the dollar in the "invest" bucket, his parents give him two pennies at the end of the month. The incentive is working. The boy says he has "way over $10" in his investing section. He's only spent money twice, he says. "I used to have more but I took some money out and put it in my 'donate section.' We used to it to buy food for people who don't have much money in their 'spend section,'" the boy told Brandon Stanton, founder of the Humans of New York blog. People around the world praised the parents for teaching their kids about money -- and kindness. The post received over 700,000 "likes" on Facebook and was shared close to 80,000 times. "This is the perfect way to teach children compassion and understanding that not everyone is as fortunate as they are, while also helping them to grow up financially responsible! You're doing a great job as a father," said one commenter on Facebook. "Talk about parenting 101. I'm taking notes for when I become a daddy," wrote another Facebook reader. Parents and relatives still play a key role in teaching children about money. In a CNNMoney/E*Trade survey of investors last year, 36% said the main way they learned about investing was from a family member or trusted friend. That was the second most popular way people learned about money and investing, behind only websites and other online tools. Tracy Bindel is one of many who credits her parents for teaching her how to save and invest wisely. She paid off all $13,000 of her student loans by age 26. Raised in a working class family in New Mexico, Bindel's mother started giving her an allowance at age four. But the mother would make Bindel and her siblings separate their allowance into different jars -- 10% for church, 40% for savings and 50% for spending money. "I knew the value of a dollar even as a really small child," Bindel told CNNMoney. "It's part of growing up working class. We couldn't just get a new toy when we wanted. We had to save for it."